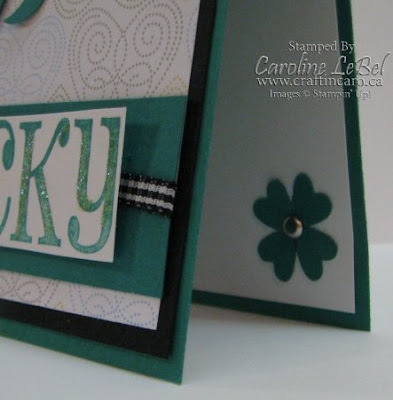 Craftin' Caro: March Club projects #2: "Lucky" St. Patrick's Day card! 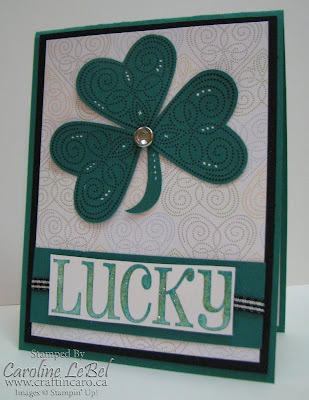 March Club projects #2: "Lucky" St. Patrick's Day card! I also used two different Sale-A-Bration freebies on it, the Polka Dot Punches set and the Delicate Dots Designer paper. When you get free stuff, you need to PLAY with it!! 1. Fold Glorious Green cardstock in half to create cardbase. Adhere Basic Black layer to the front. 2. Cut a 5” length of black gingham ribbon around the small piece of Glorious Green and adhere it to the bottom of the SAB Delicate Dots Designer Paper, allowing for a small border to show along the bottom. 3. Ink up the “Pinch Me” Jumbo wheel in Glorious Green ink. Roll the word “lucky” over the scrap Whisper White paper and then trim it out. Adhere it over the ribbon area using Stampin’ Dimensionals. 4. Stamp 3 large hearts from the Polka Dot Punches SAB set in Basic Black ink on the Glorious Green scrap paper. Punch them out using the large heart punch, and punch out a stem as well (using side of heart punch to create it). Adhere these in a clover arrangement on the Designer paper and then use paper piercer to add hole for the Clear Rhinestone brad. 5. Punch out 4 small hearts from the Glorious Green scraps and adhere them in a clover arrangement on the bottom-right corner of the large Whisper White piece. Poke a hold through the centre and add a small silver brad. Adhere this layer to the inside of your card. 6. Use white gel pen to decorate hearts on the front. Use the 2-way glue pen to add Dazzling Diamonds glitter to the front of your card as the final step.